On An Overgrown Path: Why are composers paid so little and other paid so much? Why are composers paid so little and other paid so much? There is quite rightly much indignation about the findings of a survey of fees paid to composers for new music. This report by Sound and Music, the UK agency for new music, reveals that the average fee per commission in 2013 was £1,392. Many people are asking why are composers paid so little? But very few people are asking why are composers paid so little when others in the classical music supply chain are paid so much? For instance, the fee for a single concert by a celebrity conductor - in all probability conducting a tour programme of a Mahler symphony and other works he/she has conducted dozens of times before - is around £20,000. 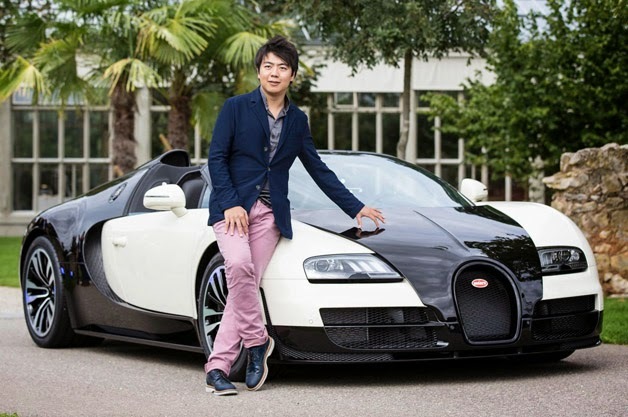 If I was a composer, I would be very angry that a top musician such as Lang Lang earns more for one concert than I do in a year, and, in addition, makes his pocket money by lending his name to the special edition £1.757 million Bugatti Veyron that he is seen with above. Bartok's Concerto for orchestra was comissioned for $ 1 k in 1943. Adjusted for inflation, this is $ 13 k or € 10 k.
How long can a family of 2 (bartok and his wife) could live in the NY of today with $ 13 k ? Because of the very valuable Sound and Music report, this brief post focuses on the unacceptable disparity between the earnings of composers and celebrity musicians. Bu, we must not forget that the same unacceptable disparity in earnings exists between other fine musicians - rank and file players, non-A list conductors etc - and the celebrity elite. This hits home, Bob. Quite some years have passed, but I still have it fixed in my mind that long after he had dropped off the A-list of conductors, Andre Previn was getting 50 000 pounds for appearances in London. At that same time, I was appalled to learn that Claudio Arrau's fee had been stuck at $8000 for years. God, think of the overheads that must come out of that fee. That's another aspect of the problem, though in general, this is not exactly a revelation. Another view of the pyramid (I use the pyramid as a geometrical shape noted for its multitude of aspects, but obviously it has a second meaning here). Something that really set me off was reading in a book that offered an insider's view of classical music in NY that Perlman receives circa $50 000 for a recital, yet he paid his regular accompanist, the late Samuel Sanders, $1000 of that. I immediately thought of a recital of Beethoven's sonatas for PIANO AND VIOLIN, a wee detail on the title page ignored for an era -- Heifetz demanded a retake of his recording of the 'Kreutzer' with Moiseiwitsch because the violin was not sufficiently to the fore, and this the only recording we have of the legendary Benno in a violin sonata or any form of chamber music. Ego writ large and pushing Beethoven's intentions aside (though joyously that first take was preserved and has been issued by Naxos in one of their peerless remasterings). And this takes me back to thoughts of Arrau, whose article on his own psychoanalysis explains so well the paramount importance in the performance of classical music of overcoming the bad manifestation of ego. There is, of course, a good one, which is simply the understanding of your abilities and powers -- without that, one could hardly be easy of mind in giving a recital of Beethoven sonatas in Carnegie Hall, but you will be if you understand that you have something to say about them. If a less than superlative pianist does the same, and mediocre ones have done it, the bad ego is at work. Some of the above is very personal in nature, but I should, of course, mention as I go that the mammoth management companies also play a major role in the issue of fees. And too the managements of orchestras and opera houses, which put themselves on the verge of bankruptcy by paying these fees. The addiction of the management of the Vancouver SO to bringing Perlman in to give 'gala' recitals -- something they had no business doing in the first place -- had its role in, once again, nigh bankrupting the VSO in the early 90s. I just mention out of interest that the biggest factor was the management and Board being hell-bent on getting every seat filled by a season subscriber. An orchestra member friend of mine who sat on the Board, the Chair -- an economist and former Federal Government minister -- tried to stop this after I mentioned to them that the management did not even advertise single-concert prices. They failed. The reason given by the resigning CEO of the orchestra as it faced bankruptcy in 1993? The paucity of sales of single-concert tickets. Ego, ignorance and stupidity all in one. And that's the plight of classical music is, at root, all about. "I should, of course, mention as I go that the mammoth management companies also play a major role in the issue of fees" - that is a very important point Philip. André Previn was managed by Jasper Parrott, whose agency then became Harrison Parrott. We were at the Alwyn/RVW Prom last week. Harrison Parrot manages the BBCSO principal conductor Sakari Oramo and also the soloist in the Lark Janine Jansen. Yes indeed, mammoth management companies play a major role in the issue of fees. We should all become truly angry by this, and keep asking the question until the disparity is erased. There is enough to go around, but the celebrity cult has ruined the economics of the business. Stop imitating pop; time to grow up.